▪️ Program begins at noon. ▪️ Tours: Depart at 12:30 p.m. and again at 2 p.m.
👟 Future Redline Greenway Tours (12:30 p.m. & 2 p.m.): Guided hike to the future site of the Redline Greenway Trail. Please wear footwear needed for a rugged hike. 🚲 Ohio & Erie Canal Towpath Trail Bike Ride Tours (12:30 p.m. & 2 p.m.): Explore the not-yet-opened-to-the-public section of the Towpath. This will be a bike ride from Merwins Wharf to Steelyard Commons. For the last six years, thousands of trail users across the country—long-timers and newbies alike—have joined Rails-to-Trails Conservancy in celebrating America's exceptional trails and trail systems on Opening Day for Trails. And to make the Opening Day for Trails - 2019 a real home run, you’ll even get a swing at winning some awesome trail gear courtesy of our sponsors and partners at Wheel & Sprocket, KEEN, Adidas, Hydro Flask Patagonia and Topo Designs. Learn more: railstotrails.org/openingday. We hope you’ll join us on the trail to make this year’s Opening Day one of the best yet! Start spreading the word with your friends and family now using #RTCOpeningDay. 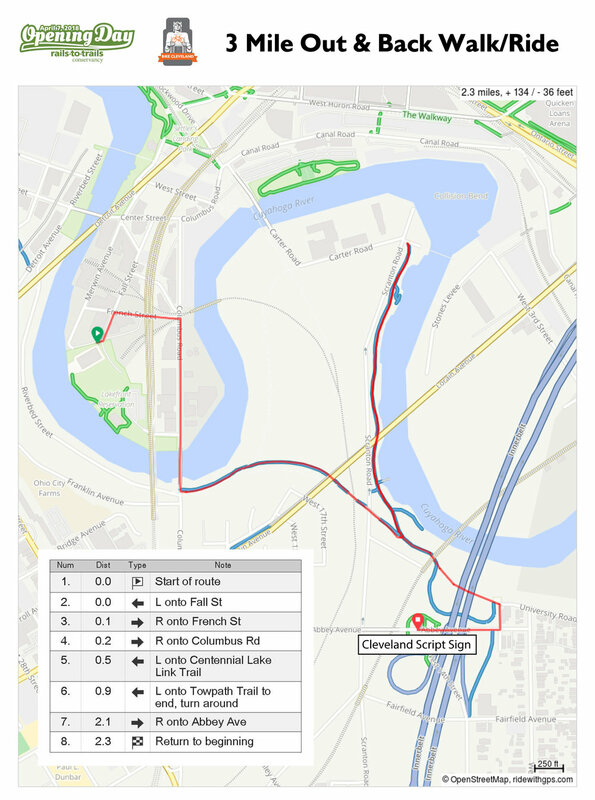 You're invited to the 2nd Annual Share the River Ramble, a 3.3-mile connect-the-dots, run/walk of the Cuyahoga River riverfront trail segments Rivers and trails are the arteries that connect people and communities to their natural resources. The Ramble physically connects people to the evolving transformation of Cleveland's riverfront that in some ways is unrecognizable from that June 22 day in 1969. 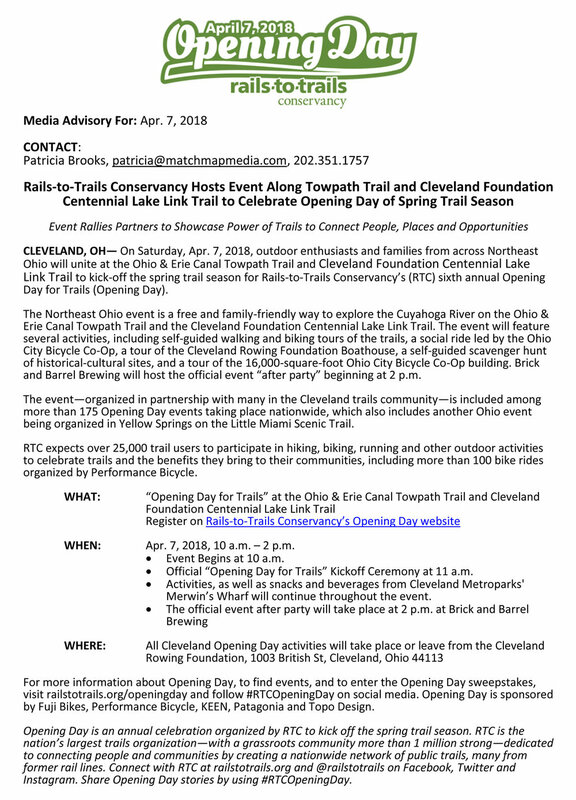 Northeast Ohio Regional Sewer District: "‘Given our role in helping to improve the health of the Cuyahoga River, we’re excited to be part of this celebration. Plus, we’re happy to support an event that connects people to our water resources." Fat Head's Brewery is our official brewery partner. 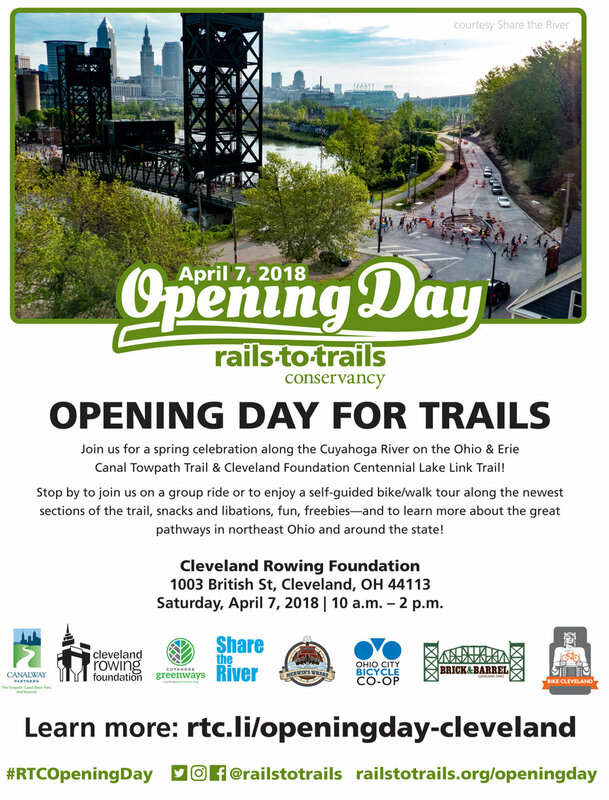 Ohio City Inc.: "Ohio City Incorporated is working with partners to tie together a growing network of trails and connecting people to the riverfront through Irishtown Bend, and we are thrilled to support the Share the River Ramble which celebrates one of our regions greatest assets, the Cuyahoga River." We're also partnering again with North Coast Mutli Sports Inc. to stage the Ramble. Our charity partner is St. Malachi Parish. Cleveland Rowing Foundation (CRF) is our site partner. 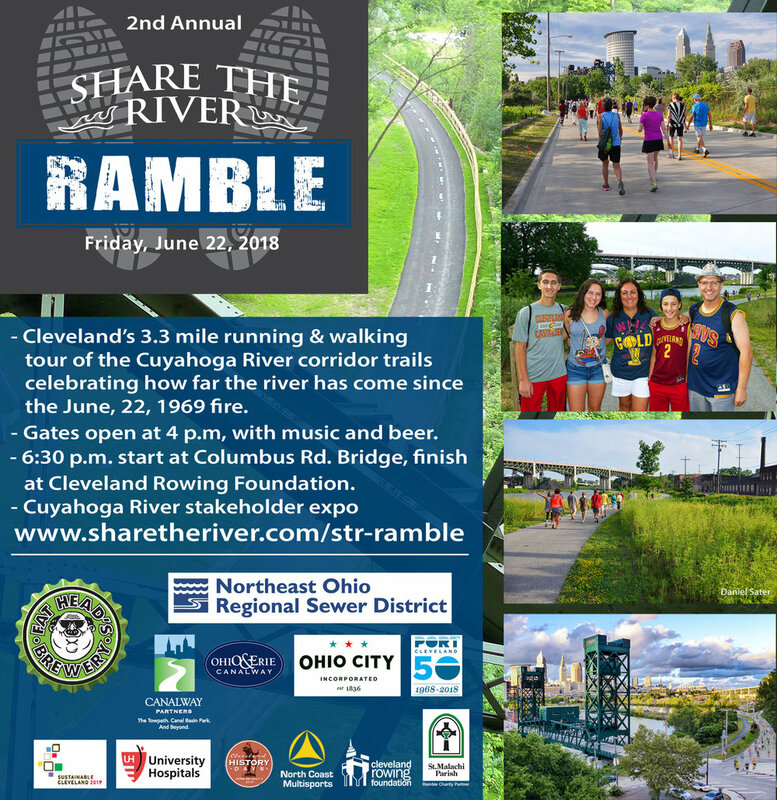 You made the 1st Annual Ramble such a success that we're adding a music and beer event at CRF/Rivergate Park where participants can connect with Share the River partner organizations, Cuyahoga River and Lake Erie stakeholders. Fat Head's Brewery is the Ramble's brewery partner and they are excited to support an event that celebrates an important turning point in Cleveland history. We're also teaming up with Nalu Standup Paddle & Surf to host Blazing Paddles, a stand-up paddleboard race on Saturday, June 23.
the benefit the above three have on Cleveland's appeal 1) as a city where people want to work, live and play in and 2) as a tourism destination. Save the date, register, and invite your friends! 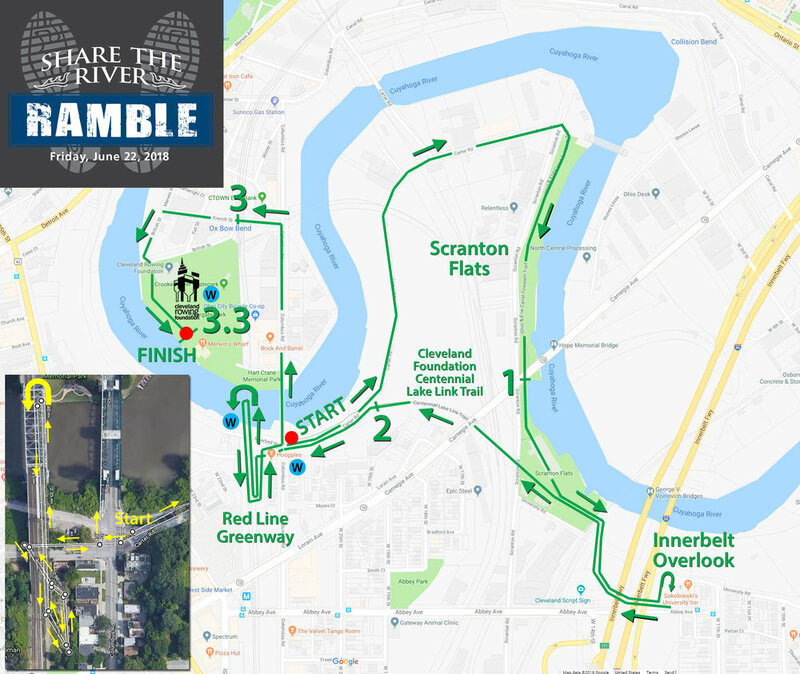 Click on the below link and register for the Share the River Ramble now! Would you like to be part of the team that's making this year's Ramble an event to remember? Register to be a volunteer or serve on one of our committees! And if you are a business, organization, foundation or individual who sees the branding value of the Ramble, we are in the process of securing sponsors! We are a full-blown experiential marketing event with an engaged social media presence and following. Please e-mail us at sharetheriver3@gmail.com. If you're on Facebook, click on this link to let your friends know you're going and then invite your friends to the Cuyahoga River Party! WKYC (Dawn Kendrick) - Exploring Cleveland's "Rails to Trails"